The University of Wisconsin-Green Bay takes a big-picture approach to education, accounting for your unique way of learning, your passion, and your perspective. Get out of the classroom and into the field, with real-life internships and graduate-style research opportunities. Be challenged to look at problems and solutions from multiple perspectives. Gain hands-on experience by working closely with outstanding faculty members. Become enriched through impressive internship opportunities; get a job that pays in multiple ways as a student employee on campus; have fun with like-minded people by joining one of our 100+ clubs and organizations; make the most of your college years living on campus; become a leader through student government; better your world with community service; and see more of it via our many opportunities to study and travel around the globe. Employers believe UWGB's approach to higher education - studying our world from multiple viewpoints - is a better way to prepare for a 21st-century career. We believe it's a better way to experience college. The numbers support this: 97% of our students are employed, in grad school, or in the military within six months of graduation. In careers and in the community, graduates of UW-Green Bay impact the lives of others in positive ways. That's an education that transforms. Everyone knows that Green Bay is known for Lambeau Field and the Packers, but the city also thrives with other professional and recreational sports, high-tech industry and manufacturing, and a wide range of opportunities in the arts. UW-Green Bay enjoys a park-like setting overlooking Lake Michigan's bay of Green Bay. At roughly one square mile, the campus is among the largest in the state. Much of the acreage is devoted to natural areas, with the central campus bordered on one side by the bay and on the other by the heavily wooded Niagara Escarpment. About 2000 students live on campus. Students find an abundance of leisure-time options, including NCAA Division I athletics and performances by big-name entertainers at the Weidner Center and Kress Events Center. Leadership opportunities exist through the Student Government Association. The student Good Times Programming Board provides social, cultural, recreational and educational programming. Students find recent Hollywood blockbusters and college classics on the popular film series, and acts including comedians, hypnotists and up-and-coming bands on the concert calendar. More than 125 clubs and organizations focus on special interests. 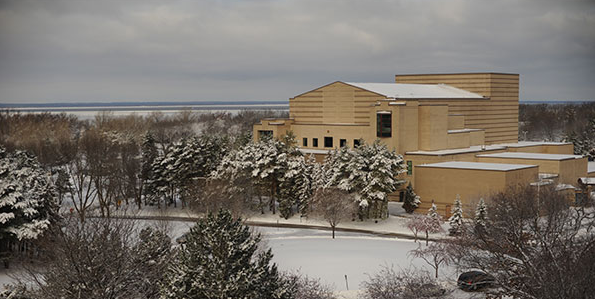 At UW-Green Bay, you will find a campus that values visual arts and performance. Our engaging faculty members prepare students for professional careers in studio art, photography, graphic design, arts management, art history, art education, music, music education and theatre and dance. Students perform and exhibit their work in top-notch facilities including the lauded Weidner Center for the Performing Arts and the esteemed Lawton Gallery, as well as in smaller venues and studios. Combine hands-on learning with academic coursework, and get ready for in-demand jobs in growing fields of engineering technology. We partner with regional leaders and technical colleges so that you will be prepared for an ever-changing industry. Get the technical skills that will make you an expert, and the critical thinking that will make you indispensable. All of the Engineering Technology programs include a strong liberal arts base along with a number of hands-on experiences, including a capstone experience or internship that often will be working with businesses and organizations within the community. The Biology program provides insights into living systems from the sub-cellular level to the ecosystem level. The Biology major prepares students for careers in cell and molecular biology, biochemistry, plant and animal biology, genetics, physiology, ecology, and field biology. A curriculum can be developed to prepare for medical, dental, veterinary, agriculture, or other professional schools, or for graduate study. The major also establishes a foundation for interdisciplinary careers in biological resources management, human biology, nutritional sciences, and science communications (technical writing, journalism, and nature interpretation). The Communication Department Mission is to develop core competencies in oral, written and visual communication for our interdisciplinary program. All students should have a basic competency in each of these areas in order to enhance their effectiveness in their chosen communication area of emphasis. Students should have a conceptual grasp of the major communication theories and the impact of technology on the communication process. The Computer Science program is about problem solving and the ability to learn new ideas and apply them. That's because the heart of software design is not the language or the developer environment, but the ability to define a problem, analyze various components, and project and evaluate potential solutions, all of which are subject to limitations and constraints inherent in a given computer. Students must understand that in industry there must be more than just a working program. Good software must not only work but must be fully documented, clearly written, and easily modifiable to meet changing and more extensive requirements. The Design Arts major is geared towards students who are interested in Graphic Design, Environmental Design and the broadening field of Visual Communications. The program provides a formal education in design with an emphasis on promoting the development of problem solving and design skills that are practical, portable and enduring in rapidly changing, technologically driven, creative fields. Economics is everywhere! As workers, consumers, and sometimes business owners all of us have through our daily activities gained some knowledge of how the economy functions. This knowledge, however, is not systematic and precise. The modern economy is an extremely complex system of social institutions. The systematic study of economics helps one to better understand this complex system of markets, enterprises (profit-motivated, government, and private, not-for-profit), unions, and many other economic and political interest groups that influence the economy and the role of government. Here are a few basic practical questions the study of economics helps one to understand. The major in Environmental Policy and Planning, offered by the Department of Public and Environmental Affairs, is an environmental studies program based in the social sciences. The Environmental Science major prepares students to analyze, understand, and solve environmental problems. The program of study in the Environmental Science major is interdisciplinary, emphasizing an integrated approach to knowledge in the field. Because the study of environmental problems requires a sound understanding of scientific principles, the Environmental Science major is grounded in the natural sciences and mathematics. The curriculum includes a social science component, enabling students to gain an understanding of environmental economic and policy issues. Field experiences, internships and practicums are emphasized. Laboratory courses are a critical part of a Human Biology major. There is a difference between studying science and doing science. Lecture courses guide in the study of science. Laboratory courses build on knowledge to produce know-how and prepare students to do science. Research projects have students do science. Lecture, lab, and research are important components of a Human Biology major. The Human Biology Program offers an interdisciplinary undergraduate major and minor. Our goal is to provide students with a curriculum that facilitates an understanding of the human organism from biological, medical, behavioral and nutritional perspectives. The central organizing concept of this major is information — its structures in verbal, visual, mediated, and quantitative forms; its storage, analysis, evaluation, processing and communication by both machines and people. The program depends on current technologies and continues to evolve as technologies change. Students can expect curricular additions and should consult with their advisor early and often to be aware of pending changes. Political Science involves the study of government, politics, and public policy both within the United States and in other settings around the world. We are a small program, but we offer courses in American government and politics, public policy and administration, political theory, comparative politics, and international relations. The faculty in the program are active in scholarly research and publication, and are also dedicated to teaching. Psychology is the systematic and scientific study of behavior and experience. It seeks to explain how physiological, personal, social, and environmental conditions influence thought and action. Research with humans aims to understand, predict, and influence behavior. In the past century, psychology has moved from being a branch of philosophy to being both an experimental science and an active helping profession. It has developed several specialized sub-areas with foci spanning from the level of the nerve cell (e.g., the neural basis of memory) to that of society (e.g., the developmental consequences of the Head Start program). Urban and Regional Studies develops individuals who want to make a difference in their community: a difference in what happens to older neighborhoods in transition; a difference in what happens as new suburban communities are planned and built; and a difference in the lives and well-being of persons across metropolitan and rural regions. U.R.S. offers undergraduates an opportunity to become familiar with concepts that will be useful whether they become community organizers, lawyers, city or regional planners, architects, teachers, economic development specialists, journalists, social workers, city managers, or enter careers in business.